Today, the Senate passed our proclamation request recognizing March as Colorectal Cancer Awareness Month. We want to thank Sen. Lori Berman for her continued support of our colorectal awareness efforts in Florida. Dr. Gerardo Lanes, FGS Past President, with DigestiveCARE also played a vital role in helping Florida Legislature recognize the importance of Colorectal Cancer screenings. If you are over 45 years old or have a family history of colorectal cancer please schedule a consultation with your gastroenterologist. Despite colorectal cancer being the 2nd leading cause of cancer, it can also have over a 90% survival rate if caught early. Don’t wait, get screened now. Thanks to Joni Brown of DigestiveCARE, we have received the official proclamation from the Florida Governor Ron DeSantis’s office, recognizing March as Colon Cancer Awareness Month in Florida. We are excited to see the newly-installed Governor waste no time recognizing the threat of this disease and the importance of colon cancer screening. As one of the leading causes of cancer-related deaths in the United States, we must stress the importance of early screening. According to a letter from the American College of Gastroenterology, the 5-year survival rate is over 90%, but because of poor screening, less than 40% of colon cancer cases are detected early. If you or your organization would like to get involved in raising awareness for this deadly, yet preventable disease please email us at info@flgastro.org. Especially in the House of Representatives, Scope of Practice Expansion and Telemedicine are two of the key issues of the 2019 Legislative Session, and both were placed in the limelight before a packed Health Quality Committee Room this past week. Committee members heard presentations on both issues, with Telemedicine taking the lead. While panel members touted the virtues of telemedicine, we continued to lobby that physicians have the final say as to whether telemedicine is appropriate and that out-of-state physicians be held accountable to both the Board of Medicine and Florida courts. While the final bill has yet to be introduced, legislators in both chambers (and on both sides of the aisle) appear to support our position. APRN Independent Practice was a more contentious issue, as proponents argued that independence would allow APRNs to treat more patients, while opponents such as us argued that independent practice would not increase the number of APRNs but would remove the physician from the health care team. While no vote was taken, Re. Cary Pigman, M.D. filed an APRN Independent Practice Bill (HB 821) almost immediately, which we will have to fight throughput the Session. In the Senate, we have been working behind the scenes on SB 732, which, as written, would require any office that performed invasive procedures of any type to be registered and inspected. We are, however, working in good faith with the sponsor, Anitere Flores, to amend the bill to allow regulation of Level II and III offices and owners, as well as physicians. It is hoped that this approach will help curb many of the abuses cited in a recent USA Today article without disrupting currently effective regulations. Finally, we are lobbying both chambers to enact legislation that would prohibit redundant Step Therapy, as requiring patients who have tried and failed with lesser treatments should not be required to repeat those failed therapies if they change health plans. As you can see, it will be a hectic Session, but we are currently well positioned to protect our doctors and patients, and we look forward to a successful sixty days. With the third of six legislative committee weeks in the books, battle lines have already formed for the 2019 Legislative Session. It has become painfully obvious that the House of Representatives will propose several Scope of Practice Expansion bills, such as Independent Practice for APRNs and PAs, Pharmacist Diagnosis and Prescribing Authority, and Psychologist Prescribing, while the Florida Senate has thus far indicated that it will resist such legislation. Conversely, initiatives such as the elimination of Redundant Step Therapy and the Recognition of Prior Authorizations are likely to advance in the Senate but face a far more hostile reception in the House of Representatives. Legislators in both chambers, however, have indicated that changes to the 2018 Opioid Law are unlikely. What does remain to be seen is the inevitable “Wild Card” issue that nobody yet sees, but which will come out of nowhere to dominate the news cycle. With a new Governor and scores of new legislators, ideas are percolating on all fronts, and February is destined to be a better harbinger of things to come. Despite the holiday season, the FGS has been busy over the past few weeks at both the Legislature and the Board of Medicine. In the Legislature, FGS received a commitments from Rep. Cary Pigman, M.D. and Sen. Lori Berman to sponsor our Cancer Awareness bill, and our lobbyist has an opportunity to meet with session leadership. While the House is expected to again introduce Independent Practice Bills for APRNs and PAs, we will oppose these measures and have received commitments from Senate members to protect our interests. On the regulatory front, the news if even better. FGS and other secured a favorable ruling from the Department of Health that eliminates the need of gastroenterologists from checking the PDMP before administering drugs, even if those drugs are administered in an office or ASC setting. Moreover, the Board of Medicine has drastically reduced the administrative requirements pertaining to the prescription of acute pain medications, which will ease the administrative burdens of our doctors. 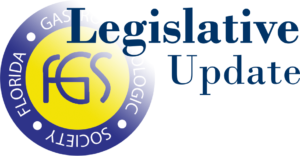 Please follow our updates throughout the legislative session, which is expected to be one of the more contentious in recent memory, as we fight to protect the business and profession of gastroenterology. 2019 FGS Annual Meeting Registration Now Open! The Florida Gastroenterologic Society was originally conceived in 1965 by James L. Borland, M.D., a well respected Gastroenterologist who practiced in Jacksonville, Florida.